Despatch invented the world’s leading carbon fiber oxidation technology which has become an industry standard. Now Despatch has reinvented the oxidation oven with revolutionary advancements to its pioneering center-to-ends technology. Oxidation is the most critical process step in the production of carbon fiber. It consumes the most energy, has the largest factory footprint, and is the largest capital investment in a carbon fiber line. Any improvement to this step will have a huge impact on the cost and quality of carbon fiber. 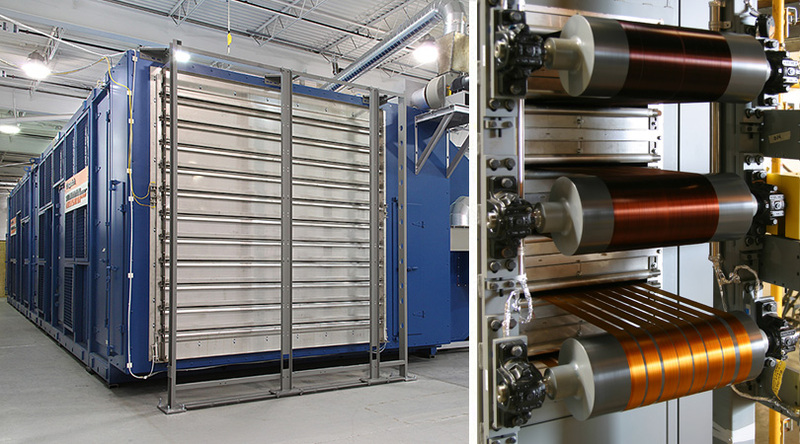 Despatch’s next generation Split-Zone™ Oxidation Oven with Novariance™ Technology allows you to aggressively push the oxidation rate, reduce oxidation cycle time, and lower the cost of high quality oxidized fiber. Split zone control (patent-pending) provides two discrete thermal profiles for the upper and lower half of the chamber. Separate plug fans and controls allow you to increase the temperature in the upper half of the oven by several degrees, advancing the rate of oxidation of the fiber. Because each oven is now split into two zones, the number of ovens required to properly oxidize the fiber can potentially be reduced. This results in a needle-moving reduction of greater than 50% in annual cost of operation. Novariance™ Technology(patent-pending) provides extremely uniform airflow across the entire width of the tow-band and throughout the process chamber. Patent-pending orifice-plate nozzle structures eliminate the side-to-side and directional variance inherent in conventional nozzle designs. Airflow is also directed into the gap between the center supply plenums which eliminates an area of low to no airflow. Airflow into the gap of the center plenum can be directed as needed to suit the precursor material. The elimination of variance along with split-zone control allows you to push the temperature in the oven, reducing oxidation cycle time by 25% or more. A sophisticated Pressure Balance System minimizes fugitive emissions to the plant, maintains a stable internal process environment and minimizes energy loss from cold air ingress. Improved heat exchangers in the Split-Zone oven can drastically reduce silica oxide build-up that can affect uniformity. Any maintenance that is still required can all be done from one side of the oven with zero disturbances to the fiber. Removable nozzles in the supply and return receivers mean you never have to enter the chamber for cleaning. Hybrid Heating allows you to operate the oven with low cost gas with the assurance of an electrical backup. Patented adjustable end louvers automatically adjust to significantly reduce heat loss and open for fast and easy threading. Rapid cool-down and heat-up capability minimizes time to restart production. With these revolutionary design improvements, oxidation will no longer limit process perfection. 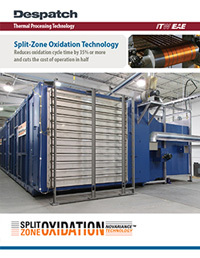 With reduced variability, the Split-Zone™ Oxidation oven will deliver higher yields, reduced cycle times and significant cost savings per kilogram of material output.